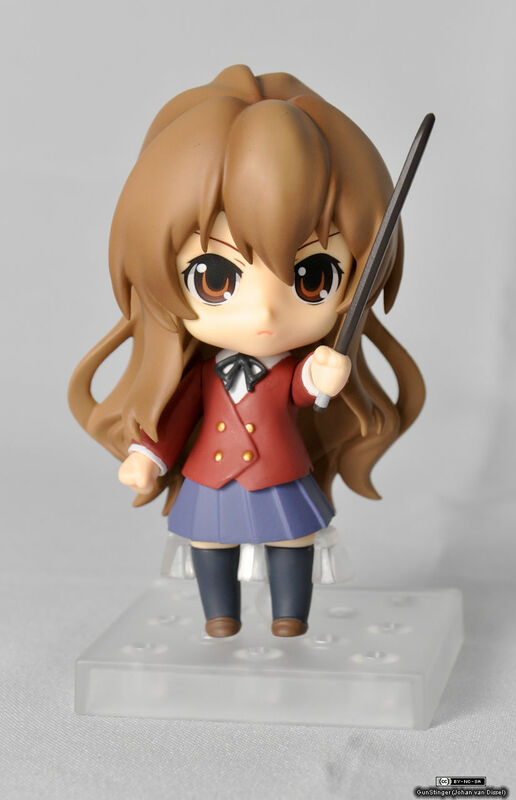 » Review: Aisaka Taiga Nendoroid by GSC うぐぅ～! 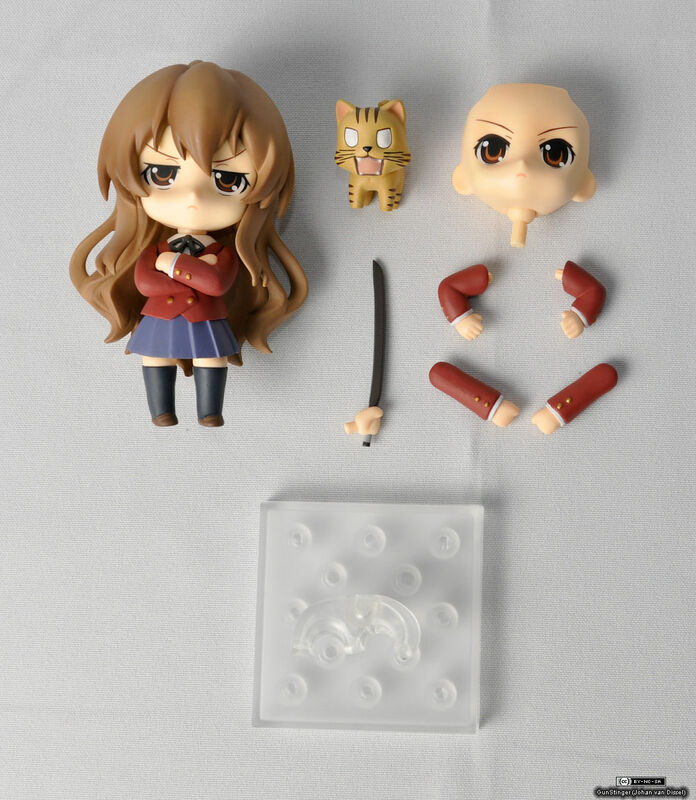 Compared to most nendoroids, especially the newer ones, there’s not a lot of parts with this one. Three sets of arms is pretty normal, but almost every one has three faces, extra legs, and some more small items. 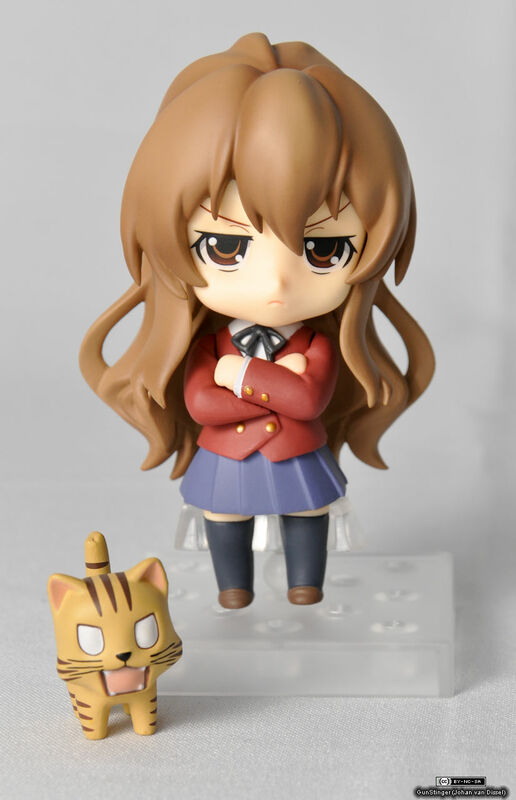 The base is one of the two types they like to use nowadays, where you can put the nendoroid in multiple places on it (the other is a slimmer version without a real base that the nendoroid stands on, like the nekomimi-shaped ones that come with Azunyan). The leg-holder is one that clips to the legs, which is good for stability, but I still prefer the ones that lightly hold the nendoroid up. I’m guessing they’ve gone for this tighter fit because there’s no changeable legs they need to accommodate for. 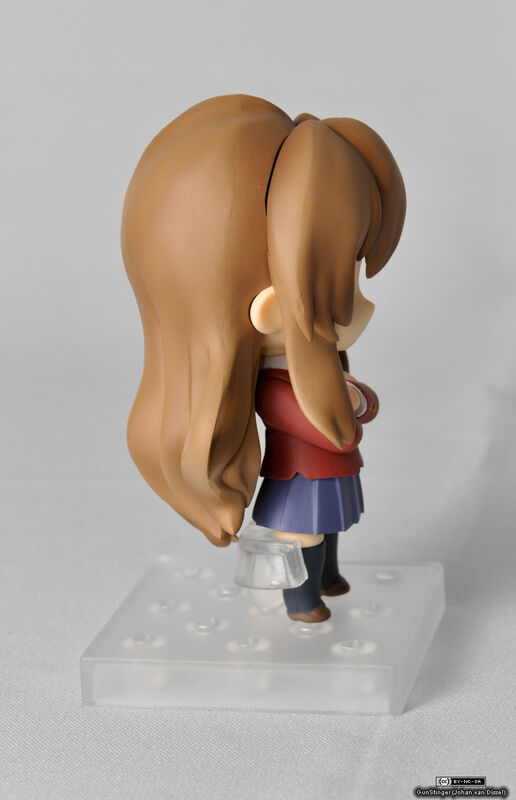 There’s one thing I don’t really like about this nendoroid: all the parts of the head are a pretty loose fit. 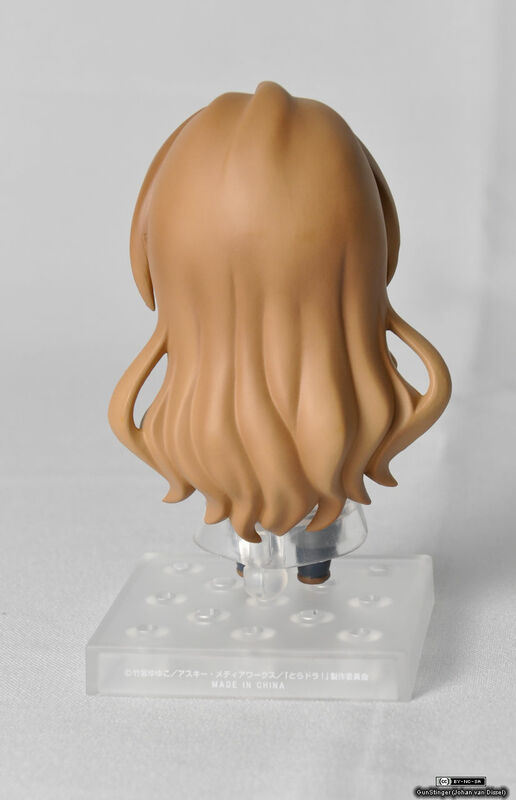 Normally you have to exert a bit of force to get the hair off, and to take the head of the body, but this time the hair part shook loose while turning her around for the photos. The joint used for the head is nice and tight though, so it’s not like she’ll start nodding off if you walk past a few time. Her arms fit nicely though, with a good, relatively tight fit. 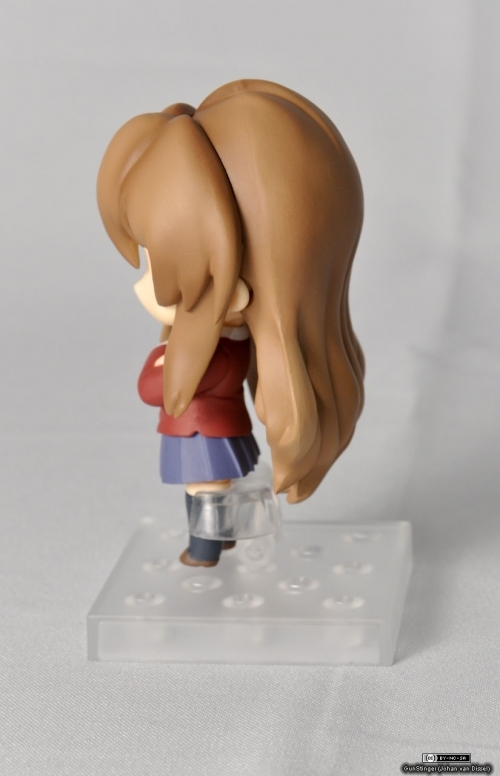 The legs are movable near the top, but you can’t really do anything with them due to the leg-holder. You can see her how easily the hair comes off – that little crack is because the hair shook loose when I turned her around for the photos. The parts fit however, so just handle her with care. I would’ve loved an angry face for her, this one is more disgruntled, but it does suit her. Taiga is disappointed with the lack of parts she’s been given. 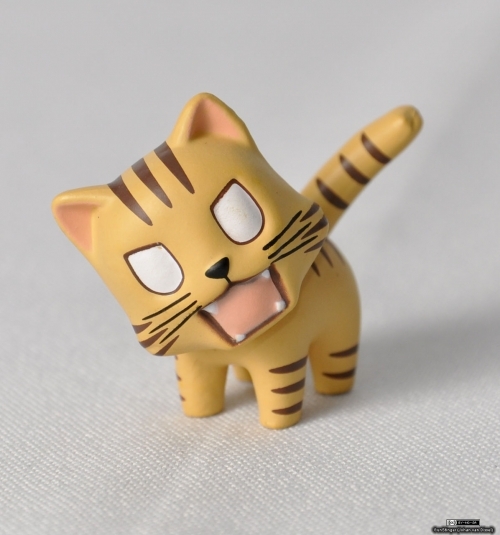 I absolutely love this little guy; movable head and tail, and a brilliant paint-job! The overall casting and paint-job are up to GSC-par, meaning it’s very nice and clean – I would be pretty surprised if they ever make a nendoroid where I won’t think that. 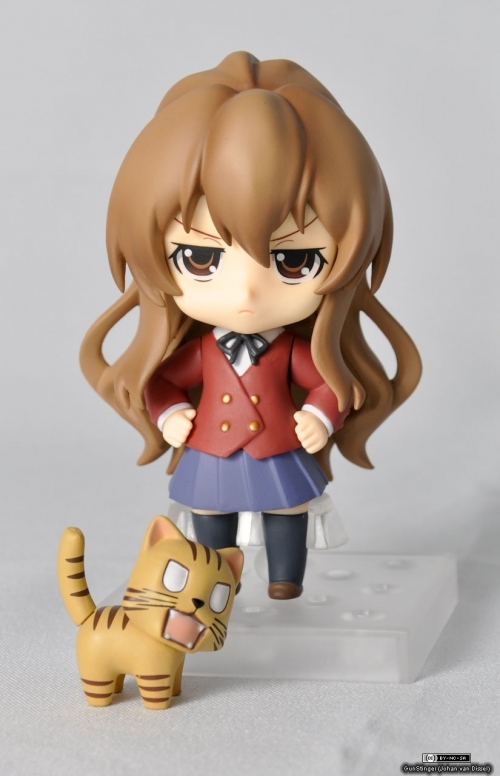 Posted on 2012/04/15 by GunStinger | Categories: Nendoroids, Reviews and was tagged with Aisaka Taiga, Good Smile Company, Nendoroid, Review, Toradora!